I know, I am a day late again. I told Rett the other day that my life is not my own right now! Another busy week off the farm starting with a Friday meeting of many different groups involved in agriculture in North Carolina. Ostensibly it was to discuss energy and farming. It was really meant to get the many disparate parties at the same table to talk with each other. You know the traditionalists and the forward thinkers. Over the years we have participated in lots of these kinds of meetings and at first it was to assure the “conventional” ag folks that we didn’t have horns and tails. Now with large scale agriculture in rough shape there is not much rancor at the table, just a lot of agreement that changes need to be made. The discussion of energy use on farms was very interesting and depressing at the same time. For us it is just a shot in the arm to continue to work on efficiency and other measures even more than we already have for years. This was followed by the SSWAG board meeting for three days! With market sandwiched in between we were really ready for a rest come Monday. But Joann made us plant another 1500 heads of lettuce then we passed out! Finally a good rain on Tuesday! We had almost an inch and it came down perfectly. Still we headed out to Raleigh on Wednesday to procure yet more pipe for the water works here at the farm. In an attempt to catch more water from our creek, while it is still available, we are increasing the size of the pipe we use to gravity feed water out of the creek and into the lower pond. 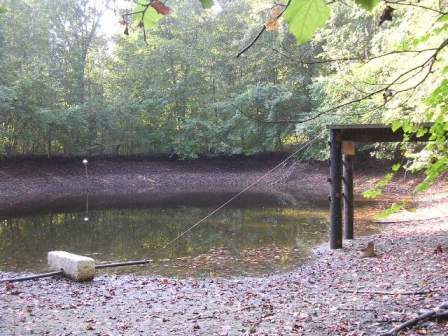 From there we can pump it up the hill to the other pond and hopefully fill it up before it gets hot. For years we have had an inch and a quarter line running for 800 feet, from the only deep place in the creek, down to the lower pond where the irrigation pump is. I am talking Roman style water movement here. It has given us a small flow which is adequate in normal conditions but in 2002 when the creek ran dry in June we realized it wasn’t enough. So we will now have a two inch pipe to give us much more water. Back to farm work today as Rachel started back for the first day this season and along with Joann we began to get ready to plant the early, early tomatoes. 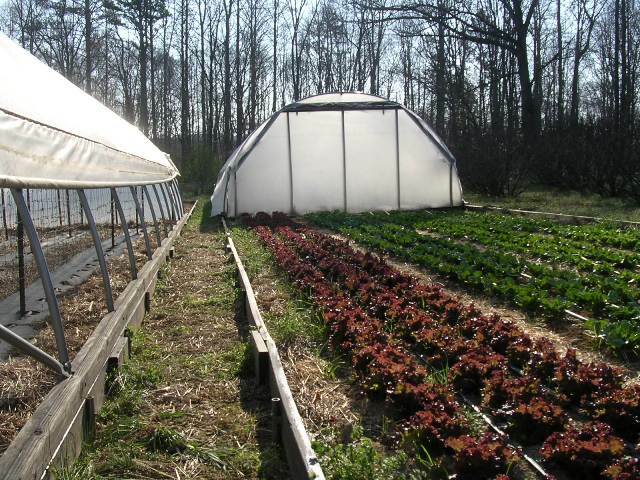 These are the Early Pick’s, Orange Blossom’s, and the first Cherokee Purple’s planted into our sliding tunnels. The transplants look great and will be happy to get into the ground early next week. First though we need to set up irrigation, fabric mulch and the trellises. 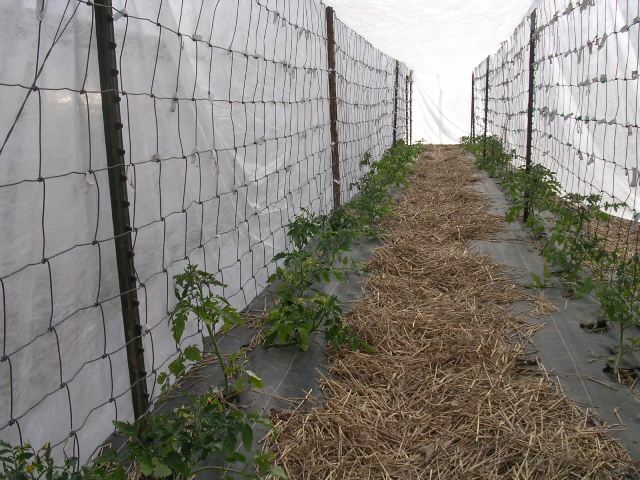 Next we have to slide the tunnels over them before we dare to plant them out in the uncertain weather of late March. It is good to have the staff back as they are lots of fun and they yank us out of our winter mindset and back to normal farm life. I will miss that second cup of coffee though. A little stiff today, yesterday was tunnel sliding day. Not quite an Olympic sport like luge, a bit more like dog sledding. Our crack team has done this together so many times now that what used to take parts of two days to complete we did in four hours! Now I will admit that we only moved four out of six tunnels but I am still quite amazed at our efficiency. One person has to go around and un-bolt everything (twelve bolts per tunnel) while another takes the front walls off. Then two people take the back walls off while others are attaching the pull straps and spraying linseed oil on the rails to “grease the skids”. Finally on the count of three the five us us lean into the straps and the thing lurches forward (this it where it is dog sled like). Tug, pull, tug down to the other end (only 50 feet away), a little fine tuning to align the bolt holes then the re-bolting and end wall re-installation begins. Once its all done it appears as if they have always been in this position until you notice that the bright lettuces and other crops that had been protected under cover are now outside squinting in the strong sunlight. Today the early tomatoes go in the ground inside the their newly moved homes. With this warm forecast they should be really happy and just take off. A harbinger of changing seasons. When you plant the last big round of lettuce and the first round of tomatoes and sunflowers in the same week you know that really warm weather is now only 6-8 weeks away. Betsy’s big planting of Lisianthus went in this week as well, 3600 tiny plants spaced “exactly” four inches apart in three rows on each bed. It’s like a precision drill team. We had an interesting experience last Sunday afternoon and again Monday night. 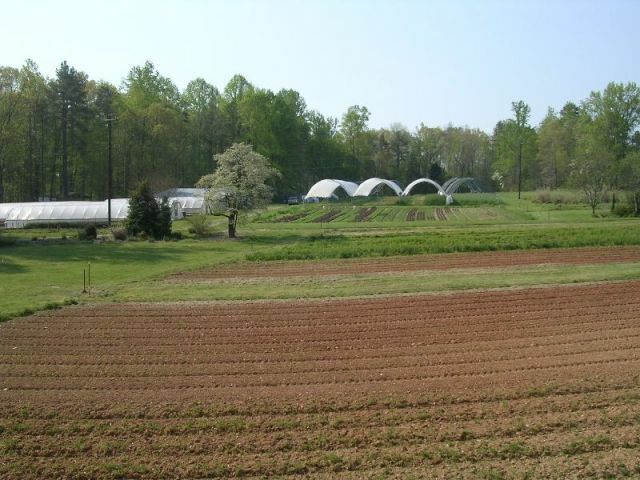 The Renewing America’s Food Traditions (RAFT) committee was meeting in Pittsboro. RAFT is a collaboration between Slow Food, American Livestock Breeds Conservancy, Chefs Collaborative, Seed Savers Exchange and a few other groups. The aim is to identify food plant varieties and breeds of animals that are indigenous to the US and in danger of being lost from lack of use in culinary traditions. Once identified they can then be promoted and hopefully saved. This is how the heritage turkeys where brought back from the edge of disappearing. Sunday we participated in a blind tasting of four breeds of chickens. The principle purpose of the exercise was to develop a tasting protocol that can be used for most poultry and then easily modified for other animals as well. Once developed then good descriptors of the various breeds can be arrived at so when chefs and consumers want to know the qualities of a breed they can be given a fairly detailed description. After carefully describing, both numerically and verbally, and tasting the white meat, dark meat and the skin of four different chickens and then the next night having a wonderful full meal prepared with the favored breed, Betsy and I are off chicken for a while! The one good thing about a drought, the weeds don’t grow very fast! This week has been busy with a combination of cultivating for weeds and then setting up the rest of the irrigation in the newly “weeded” beds. Cultivation can mean a lot of things when describing the process of growing crops but for us it means using “stirrup” hoes. Like a stirrup on a horses saddle, the blade slices just under the soil surface no more than a inch deep. 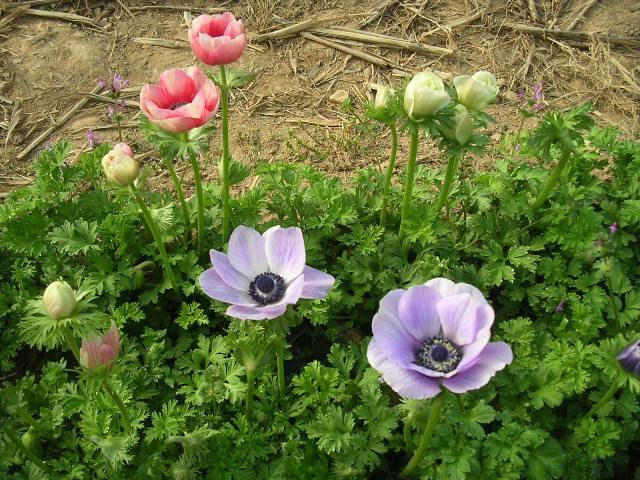 The perfect timing is just before the weeds come up or have just germinated, otherwise it is a lot more work and less effective for those weeds that now have large root systems. We joke around here that I am the straight line police because all of the plants run in exact parallel rows, usually three to a bed. 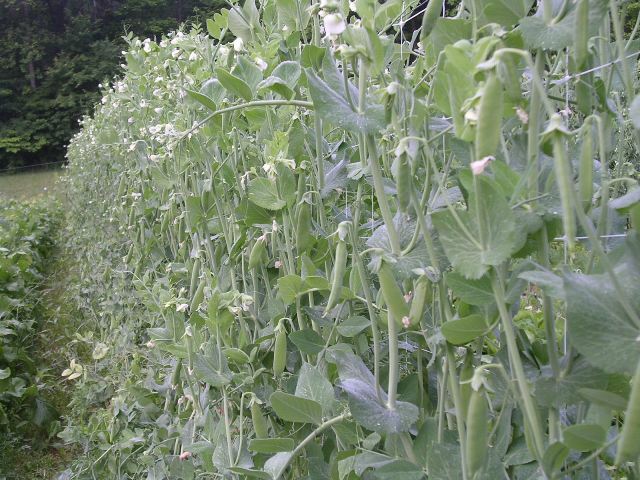 The main reason for the straight rows is that it makes the cultivation much easier than if everything was a crazy zigzag. Our secret weapon is a Swiss made “wheel hoe”, this is the Ferrari of wheel hoes. Made with multi adjustable handles on a small pneumatic tire it handles like a dream. Attached to this can be may different implements but the best is an eight inch wide stirrup. A person can walk up and down the rows and cultivate with ease. If the rows are straight and the timing correct a person can cover a quarter acre in hour or so. Rett is the king of the wheel hoe around here, no bending over! Rain, rain, rain marvelous rain! Another 1.8 inches last Wednesday and Thursday. Everything looks great, the weeds are growing too but the ponds are full now! Of course there are always downsides to everything but considering the need for the water I won’t whine too much. We are in the middle of lettuce season and when the plants are getting big enough to harvest lots of rain makes them very fragile and susceptible to disease. We plant the lettuce three rows to the bed twelve inches apart so there is not much air flow around the plants when they get to harvest stage. It is like your closet in the middle of the humid summer, fungus and mold loves to grow in these conditions. There is a soil borne lettuce disease appropriately called “bottom rot” because that is what it does. Our strategy for control is raised beds, many years in the crop rotation, and careful watering at the late stages. Well just before the rains started I irrigated, as I get to where I never believe we will actually get rain, then we got over three inches in the last week. We have seen a fair amount of the problem but I think have worked through all the bad beds. Adding insult to injury I had to cut Weaver Street Market’s lettuce in the rain last Thursday. I waited as long into the afternoon as I could hoping the rain would stop as wet lettuce is very tender and frankly cutting in the rain is not much fun. Finally I gave up and spent two hours hunched over with lettuce knife in hand. Of course by the time I got to Weaver Street’s back door the rain had ended but they had the lettuce they needed, such is the life of a produce grower. Yesterday was the second installment of covering the Big Tops. This time it was the set that covers Betsy’s flowers that don’t like to be wet when it’s time to cut them. Four bays each covered with 30′ X 100′ sheets of plastic. We had the perfect windless morning and the A team on hand to perform. After three years of trying different approaches we now have settled on a four person system. Two people control the corners on one end and we pull the plastic over the top from one end to the other. Betsy is working a long push pole moving down the length of the tunnel helping the plastic over the top and I scamper around, some on a step ladder, some on the ground pulling the leading edge down as we make progress down the tunnel. Finally with it all draped over the top we clip the starting end on to the end bow and then got to the opposite end and pull the excess down that way and clip that end off. With these tunnels the clips just hold the ends in position. The plastic is really held on with a roping system that criss crosses over the top of the tunnels and are anchored on the legs. It is quite a show as Betsy and Joann pull the rope back and forth over the top as Rett and I follow tightening it. We approached a new world record, covering four bays clipped and roped in three and a half hours! We may be heading out on the road to make the big money! The upper pond last fall is now finally full! This is two months worth of irrigation water. So busy yesterday that I couldn’t get this done until this morning (after chasing yet more roaming turkeys), see you at market! The big pepper plant is today and I hope we are ready for it. It is a challenge this year as we are planting into maybe the most difficult field we have, as far as soil is concerned. This is the field that we call “the Top” as it is the highest point on the farm and the farthest away from everything. When we started going to Farmers’ Market in 1986 this was the only piece of ground that wasn’t planted to blackberries and raspberries so we turned it over and began the experiment with vegetables and cut flowers. My brother Jon was here at that time and vegetables were his area of expertise. He and Betsy borrowed a neighbors plow and turned over this far corner of the farm and found a mixed bag. The field is long and irregular in shape (you know those of use who are members of the straight line police hate that) and the soil changes from one end to the other. Marvelous sandy loam on the bottom end but the top end is the most difficult red clay we own, very slow to dry out and almost impossible to work into a good seed bed. Joann is still scarred from having to plant tomatoes into that red clay and having to stack what amounted to pieces of brick around the root balls. This spring, however, the beds worked up as nicely as they ever have so we don’t have to fight that problem, at least on half of the 1600 feet of pepper beds. The other half we always plant without tilling the soil, right into thick cover crop of grain rye and hairy vetch that we have killed and flattened down by rolling it. It is like growing our fertilizer and mulch right in place. After we roll it down we cut slits into the mulch and the soil, with the the tractor, to set the plants into. If it is too dry the cutting wheels can’t cut through. If it is too wet, especially in red clay, it can make a mess that is hard to plant into. With all of the rain in the last two weeks I am a bit worried that it could be a bit too wet. We’ll find out later today if that is the case! None-the-less Rachel and Will (the newest staff member) will be charged with carefully interpreting my diagram of which pepper varieties go where. 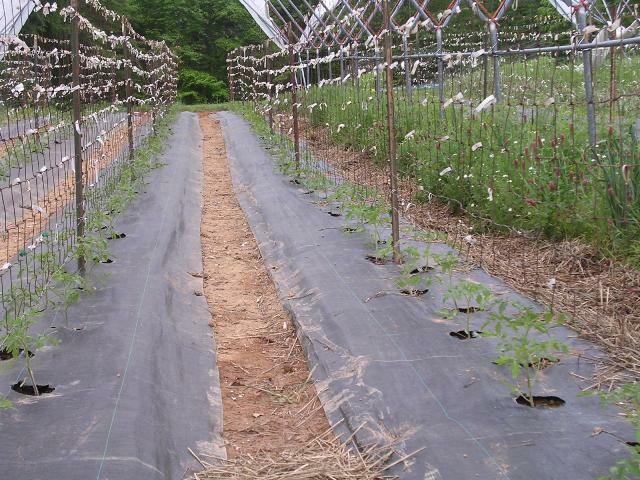 Just like the tomatoes there is a strategy as to which ones like or will do better in the different soil types. The hot peppers definitely need to be in the warmer sandy loam soil while the more disease resistant sweet bells can stand up better to the red clay. No matter what it will be one at time until the over 2000 plants are tucked into the ground whether it be sandy or clayey. Late graduation day for the turkeys this week. Usually we start letting them out to get used to the idea at three weeks of age. This year because we got them earlier and it has been cold we just let them out yesterday for the first time. Now five weeks old and full of extra energy from being cooped up they have been acting up already! We pull one of the shelters up in front of the brooder building, about five feet away and then put up some chicken wire between the two. 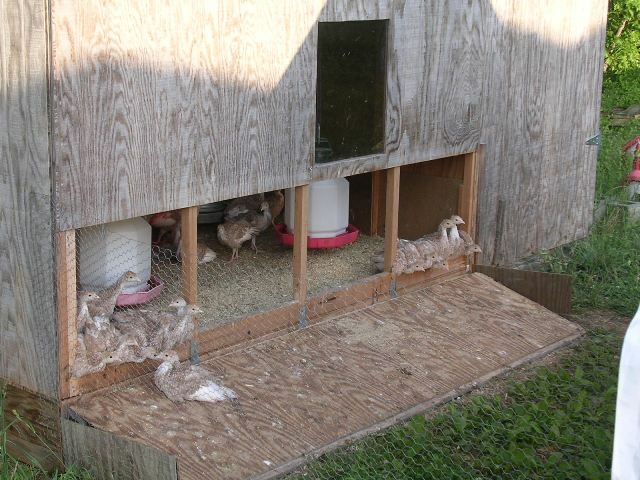 There is a ramp/door on the front of the brooder so they can come in and out. Usually they are very tentative and take a day or so to get used to going out, into the new shelter, and eating grass. These guys came out and started flying over the chicken wire almost immediately. I had to chase some down into the woods to catch them. We clipped the wing feathers on these bad actors after they flew out a second time. I hope we can get them calmed down or it will be a long summer of rounding up escapees. The endless lettuce season rolls on. At least it feels endless these days as I go out to cut four mornings a week. The staff arrives each morning and I brief them on the days jobs and end with “of course I will be cutting lettuce if you need me”. Mondays and Thursdays I cut for delivery to Weaver Street Market, Wednesdays and Fridays I cut for the markets and the restaurants. Usually two, sometimes three, hours each morning. We are now into the fourth week with one big week left to go. Lettuce is one crop that I do all the harvesting of. It is such and ephemeral plant that it takes sometime to develop an eye for which head is large enough and tender enough to cut. In a few days the heads that I pass over will be big enough to then take, in a few more days they will be too far gone, getting tough and bitter. The hotter it gets the faster this progression occurs. 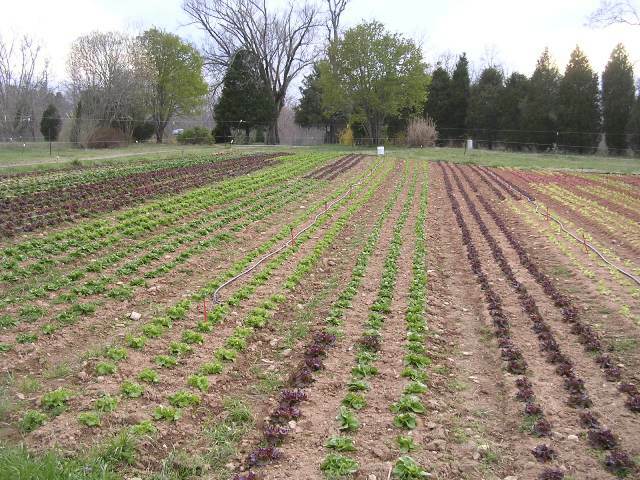 The weather of the past few weeks has been about as ideal as we get in North Carolina as far as lettuce is concerned so the pressure has been off a bit. It is easy for me to train the staff on what is the right size of turnip to pick and how big a bunch is but the lettuce thing is more like “is this flower at the right stage to harvest?”, it is subjective (hence the reason why Betsy cuts almost every flower stem on the farm). Twenty four heads to a case, six cases and hour if I have to search around, ten cases and hour if the planting is really uniform, that is one head every fifteen seconds! I am counting the seconds until the season is done. Big event at the Market this Saturday. The Market is having a fundraiser for our sister market in New Orleans and all of the farmers and fishers who where devastated by hurricane Katrina last fall. Like the Carrboro Market which was open two days after hurricane Fran crippled this area in 1996, the Crescent City Market was up and running only weeks after the water receded in New Orleans. Markets are an important social component for towns and cities as well as sources of food. Muffulettas and Gumbo prepared by a dozen Triangle chefs will be available to go for $10/serving, for more details go to the Carrboro Market website . All proceeds will go to the Crescent City Markets and their efforts to bring their vendors back into production. Come on out for the good food! It has been the normal orchestrated chaos this week with more planting of summer crops, more zinnias, sunflowers, celosia, cucumbers and another planting of Cherokee Purple tomatoes. Weeding, trellising of flowers and vegetables, mowing, harvesting and on and on. The turkeys got so wild last week that we had to trim the wing feathers on all of them. 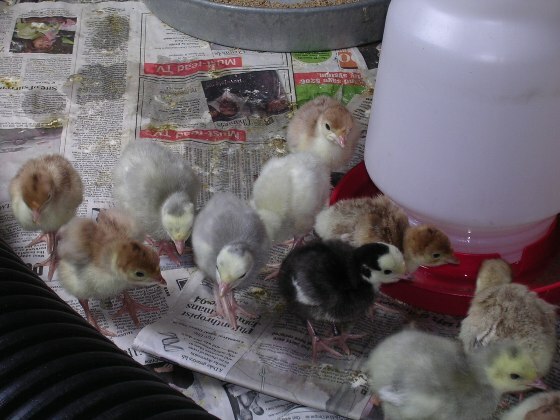 After chasing the little miscreants all over the farm, including one that spent the night out because we couldn’t catch him at all, we decided we had to make sure none of them could fly until they learned better behavior, maybe this is where the term “grounded” came from that our parents threatened us with as kids. Well this was no idle threat for these birds! They go out to the field permanently tomorrow.